Textbook theory of sunspot activity faces new difficulties posed by the magnetically confined structures of the penumbra. The old idea that the penumbra filaments are “convection currents” must now give way to new evidence that electric currents dominate these solar structures. We can thank the “Astronomy Picture of the Day” folks for the two images above. They are from a brief sequence that can be viewed as a movie by clicking on either of the links given here (small) or here (large). The movie shows the sunspot in false-color images from different heights above the surface or photosphere. The first image (upper image in the picture above) shows the Sun's photosphere as it normally appears, covered with granules. The large dark sunspot sports a clear dark umbra in the center through which we can peer into the cooler region beneath the surface. Surrounding the sunspot is the lighter penumbra, composed of rope-vortices rising explosively from beneath the surface. In the linked movie, the images appearing toward the middle of the sequence show what is occurring a few hundred kilometers above the photosphere, as the twisted filaments of the penumbra begin to spread out horizontally. 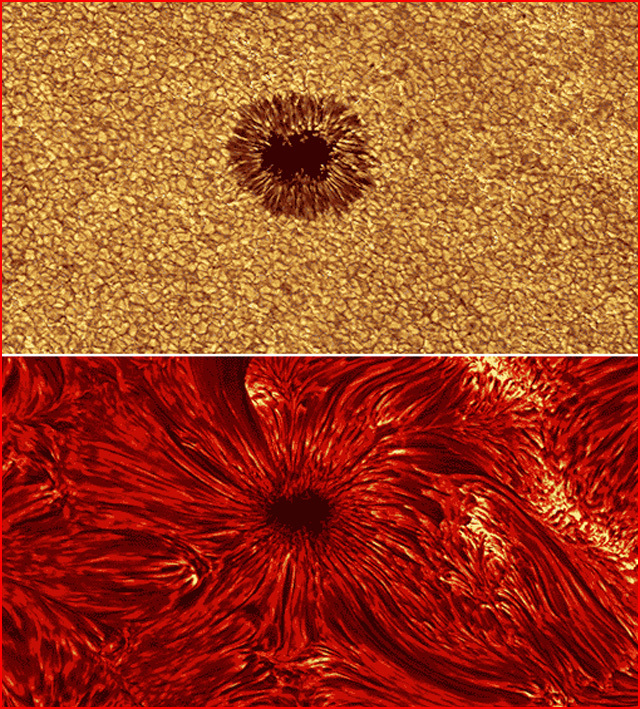 The last image of the sequence (lower image above) shows the Sun at a few thousand kilometers into the chromosphere, the layer of the Sun’s atmosphere just above the photosphere. Here we see the “ropes” of the sunspot penumbra extending outward into a surrounding maze of filaments, all constrained by the complex magnetic fields that have so amazed and enchanted solar physicists in recent years. For decades, the standard model of the Sun treated the penumbra filaments as “convection cells”, columns of hot gases transporting heat from the interior to the surface. Astrophysicists formulated such concepts while under the spell of gravity and familiar gas laws. Seeing the Sun as an isolated island in space, they had no other tools to work with. But proponents of the Electric Universe assert that there are no isolated islands in the universe. They contend that concepts of simple heat transport are alien to the plasma discharge behavior evident in sunspot activity. As Wallace Thornhill observed, the penumbra filaments “bear no resemblance to any known form of convection in a hot gas, magnetic fields or no”. So we pose the question: what is controlling the behavior of the penumbra in these pictures—magnetic fields or gas laws? The new profile of the solar atmosphere has left the astrophysicists in a state of ambivalence. The APOD folks do not describe the network of interacting filaments as “convection cells”. They say simply, “Here magnetic field lines can be clearly followed outward from the sunspot to distant regions”. That is not the behavior of convection cells! The problem is that now the solar physicists appear to have fallen under the spell of another popular fiction—that science can appropriately discuss magnetic fields without concerning itself with the cause. Now the refrain is, “Just look at all those twisted magnetic fields!” The solar “experts” have forgotten first principles: only electric currents produce magnetic fields. Yes, the complex magnetic fields are there, and they are the predictable effect of “anode tufting” or secondary discharging above the positively charged sphere in a glow discharge. While the electric model of the Sun remains to be elaborated in important details, sunspot activity is eminently suited as a critical test. Where should one look for evidence of electron currents flowing into the Sun? If, as Thornhill claims, the sunspot is the opening through which discharge currents pass from the more negatively charged torus around the Sun, then sunspot activity should be investigated systematically with an entirely new vantage point in mind.